Manufacturers and retailers are increasingly outsourcing the management of their warehouses and distribution centres to specialist logistics service providers (LSPs). Today’s LSPs take goods from various sources and then bundle them for the same or similar destinations or sort them for different destinations. Sometimes, storage is not involved at all and goods are moved on immediately. At other times, LSPs even assemble retail displays. For this kind of complex warehouse management you need close collaboration among all of your trading partners. Our standards help cooperation and coordination by allowing accurate real-time information to be accessed by everyone involved. Unilever operates several dozen warehouses across Europe with its logistics partners. It collaborated with DHL Supply Chain on a pilot project to use GS1 standards at warehouses in the UK, Spain, Hungary, Belgium and Slovakia. Support and maintenance costs dropped. The efficiency gains were so dramatic that the standards are now being rolled out across all warehouses in Europe. 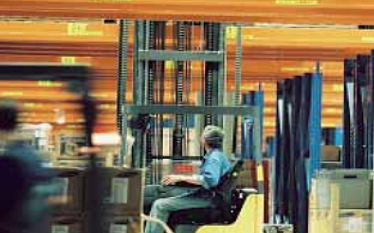 We can help you to start using our standards for warehouse management.